On Memorial Day in 1948, the Columbia River, swirling fifteen feet above normal, punched a hole in a railroad embankment that served as a dike, starting a flood that would leave 18,000 people homeless and alter race relations in Portland forever. For eight years, the embankment had kept the river out of a newly developed 648-acre complex called Vanport, then the largest public housing project in the United States.Â Originally meant to be temporary, Vanport was shipbuilding-magnate Henry Kaiserâ€™s answer to a lack of local housing in the early days of World War II, when he was importing men and women from across the United States to work in his Portland-area shipyards.Â At the height of the war in 1944, close to 40,000 people lived in Vanport, including 6,000 African Americans, three times as many as had lived in all of Portland two years before. Kaiser had already erected the first of his shipyards on the Columbia when America entered the war in 1941.Â As Americaâ€™s involvement in the war escalated and the demand for ships grew, he added two more shipyards, but he could not find enough local workers for them.Â He decided to recruit across the nation, offering high wages and free transportation.Â Before his campaign was a year old, 100,000 workers had flocked to Portland.Â The problem was there were few places for them to live.Â This was especially true for black workers, who encountered a city that didnâ€™t want them. When Kaiser began his recruiting, he assumed Portland would build temporary public housing to accommodate his workers, as cities across the country had when becoming war industries locales.Â But the local housing authority, in the grip of the real estate industry, balked at having public housing compete with private interests.Â At the same time, the private housing market was too limited to handle the influx, and real estate practices, written into the real estate industryâ€™s Code of Ethics, restricted African Americans to a tiny patch of the city called Albina, an area far too small for the thousands arriving. Kaiserâ€™s response was to purchase a floodplain outside the cityâ€™s limits (and authority) and, with federal funds and cheap material deemed expendable by the war industry, build what became the second-largest city in Oregon.Â During its short life, Vanport would be called everything from a â€œMiracle Cityâ€� to a â€œMasterpiece of Urban Planningâ€� to the â€œNorthwestâ€™s unique sociological experimentâ€� to the â€œNegro project.â€�Â Its greatest legacy, however, may be its role in preparing mostly-white Oregon for the multicultural post-war era. Life in Vanport was never easy.Â With 40,000 people pressed together in thin-walled buildings, some working days and others at night, noise was constant.Â Because both mothers and fathers worked, children were often left unattended.Â And thanks to the Northwest weather and the projectâ€™s location, mud was everywhere.Â For many, though, the biggest adjustment was living beside people different from themselves. Portland had long had a reputation as what one national black leader called â€œthe most prejudiced (city) in the west,â€� a place where African Americans were limited to work on the railroads or as domestics in homes and hotels.Â As a result, only 2,000 blacks lived in the city just before the war.Â In the rest of Oregon, there were virtually none.Â This was due in part to Oregonâ€™s first constitution, which prohibited blacks from even entering the state, and to the activities of the Ku Klux Klan, which in the 1920s had up to 200,000 Oregon members. Given this background, Vanport was a risky experiment, allowing large numbers of whites and blacks to live together for the first time.Â Many local leaders railed against it, predicting dire results.Â In practice, though, the experiment worked.Â Discrimination did not endÂ â€”Â blacks were unofficially segregated into the least desirable units and unjustly blamed for creating a climate of crimeÂ â€”Â but for the most part the two parties lived in peace.Â The Vanport schools were integrated, as were recreational facilities and churches, and African Americans were able to form several groups that helped them protect and expand their rights. When the war was over and the shipyard jobs ended, despite calls by civic leaders for them to leave, many blacks stayed in Vanport, making Oregon their home.Â When the flood came in 1948, destroying the complex, 25% of those left homeless were African American.Â This created a dilemma: with so many of the people the city had always termed â€œundesirableâ€� in need, how would Portland respond? The cityâ€™s response was not a clear victory for integration and human rights, but it gave hints that positive change was possible.Â Many whites ignored those left homeless, hoping they would leave the state or expecting the small Albina community to care for them.Â Many others, however, welcomed the suffering into their homes, giving them temporary shelter and, in the process, coming to know members of a minority community for the first time. Discrimination in Portland was far from over.Â In the 1950s the real estate industry revised its Code of Ethics, but in 1960, when over 10,000 African Americans lived in the city, 73 percent of them were still huddled together in Albina.Â Because of this concentration, Portlandâ€™s schools were as segregated as Alabamaâ€™s. 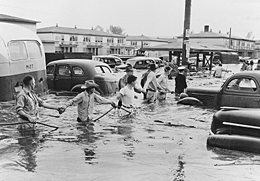 It would take the court rulings, changes in federal laws, and shifts in social attitudes that came with the national Civil Rights Movement to make Oregon a more hospitable place for non-whites, but the Vanport flood, by confronting people with a clear choice between callousness and compassion, allowed the first trickle of change to flow.